The two point five million dollars cheque was handed to Acting Prime Minister Aiyaz Sayed-Khaiyum yesterday afternoon. Sayed-Khaiyum who is also Aviation Minister has expressed the government’s desire that Fiji become the ‘Geneva’ of the Pacific – which requires reliable air services. 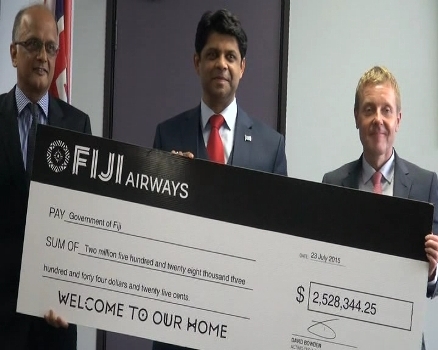 “There are many international organisations based in Fiji and indeed many more can be, so it’s critical that our national carrier play an important role in terms of air connectivity. We also need to continue to ensure that Fiji Airways become stronger. We have a competitive market." Acting Fiji Airways Chief Executive, David Bowden says the airline recognises certain lapse in services during flight disruptions and they’re taking steps to ensure these aren’t repeated and that passengers are not inconvenienced.